I attended Idaho State University and received my degree in Elementary Education in 2004. I currently teach second grade at Fox Hollow Elementary here in Idaho Falls. I am happily married and we have two dogs. Karen Collins Martin has a birthday today. 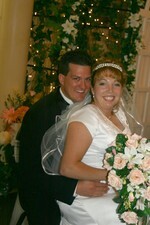 Chris and I got married on August 10, 2005. This is a picture from when we went to Alaska on our honeymoon. This is Ginger and Shadow in our backyard.